And even though the battle was for second, anything can happen in racing and it could have been a really great finish. “If Jerry had gotten taken out in one of those wrecks, we would have had a battle for the win. You never know what’s going to happen. I came out of the pits and I knew that stuff was going to happen in front of me. I was shocked that it happened when we were all single file. There were guys who had tires and guys who didn’t have tires. I don’t know why they were wrecking each other with 60 laps to go. But that made it that much easier for Jerry, Chuck and I. The finish also had some implications when it came to the final point standings. Was it hard for Hoag to decide whether to head south to Ace or east to Thompson from his New York shop? After Thompson, Hoag packed it in for the season, deciding not to tow to the North vs. South Shootout or Turkey Derby, but instead take it easy after finishing the season strong at Thompson. Eddie Flemke was another driver who crashed hard at Thompson. He emerged from his racecar uninjured. Beers wasn’t alone on the hook. 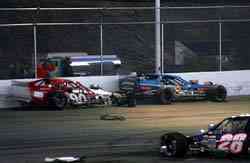 Seven modifieds dropped out of the race with accident damage and numerous other ones limped around wounded. That fact wasn’t lost on Beers. “Everybody was off for a month, so they just came unglued tonight,” said Beers. Alex Hoag has had a frustrating year where several promising runs have ended without the finishes that he’s wanted on the NASCAR Whelen Southern Modified Tour. He decided to skip that tour’s season finale to go to Thompson’s World Series and the move paid off with a finish of eighth against some tough competition. Donny Lia got together with two drivers at Thompson. In an ironic twist, those two were twin brothers. It took nearly a month of rainouts and postponement to get the World Series at Thompson International Speedway (CT) underway, but the fans that showed up for the race were rewarded with a battle for second-place that was well worth the wait. Young lions Doug Coby and Chuck Hossfeld battled to the finish line for the runner-up spot. 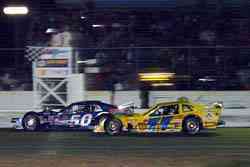 Both drivers ran side-by-side to the line cleanly with Hossfeld getting the advantage at the finish. Coby reeled Hossfeld in towards the end of the race and made up a lot of ground just to be able to battle with him. So he was hoping that his season would end much differently than it began when the Tour ended 2005 at Thompson. That wasn’t the case. Beers was the victim of a multi-car wreck in turn two and hit the wall hard. This time he was okay, but his racecar was heavily damaged. 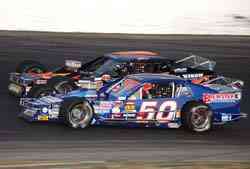 Thompson was the final race in the Don Barker-owned #50 car for Chuck Hossfeld. The 2003-championship winning team is calling it quits after this season and selling off their cars. That leaves Hossfeld without a ride for 2006 – so far. Speed51.com asked Hossfeld what his prospects were, but he had little to talk about after the Thompson event. The most memorable part of the day though will be racing with his father early in the race for the lead. 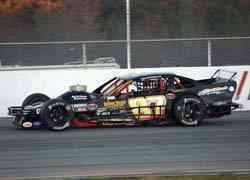 “I had a couple of good restarts at the beginning with my Dad right next to me,” said Matt Hirschman. “I wanted to race with him, but I wasn’t going to take any unnecessarily risks. He got in front of me every time and I ran second to him for awhile. I felt that we were pretty equal and I ran right with him. Eric Beers started out the season with a hard wreck at Thompson, where he suffered multiple injuries. In the time since, he came back and won his first career Modified Tour race, got into the top five of the point standings despite missing one race and has had a pretty darn good season. Matt wrecked on lap 42 and was done for the day. He finished 24th. “It was a rookie mistake,” said Matt Hirschman. “There was nothing that I could do about getting pinned down. The only way that I could have avoided that was to move someone up. But I didn’t expect the car to jump out from under me when I was pinned down. The back jumped out and I tried to catch it, but the guys were right behind me. Eric was right behind me and it wrecked a couple of cars other than mine. I hate for that and I hate it for my guys. 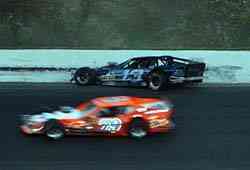 Matt Hirschman started on the front row with his father Tony at Thompson. At the beginning of the race, they were battling each other for the lead. But the two had very different outcomes to the race. By the end of the day, Tony was celebrating his fifth championship while Matt was loading his battered racecar. Lia’s spotter mistakenly cleared him on lap 10 when he drifted up and made contact with Ted Christopher. Later on, Lia tagged the #79 of Mike Christopher when they were both racing for the lead. So Lia probably won’t be sharing a thanksgiving turkey with Christopher family this week. Just surviving the race was an accomplishment that most veterans couldn’t claim at Thompson. So how did Hoag manage to do it? 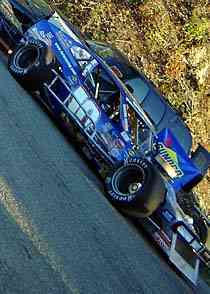 Flemke’s Gary Teto-owned car was built by Raceworks, the company owned by Flemke and Reggie Ruggiero. After Flemke’s comments, Speed51.com jokingly asked if Reggie built this particular car. Flemke didn’t let himself get too down after the wreck. “I’m happy,” said Flemke. “What are you going to do? We had bad luck and we put ourselves in a couple of bad positions.